There are two soldiers, each in a hole, with an order to kill the other. They both are tired and want the war to end. Finally one gives up and goes off to kill the other, only to find he has done the same. He sees that the other soldier is more like himself than he thought. In a desperate measure to end the war he doesn't understand, he launches a message in a bottle to the other hold. 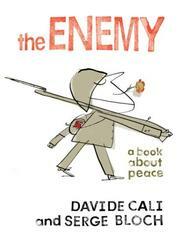 Bloch, Serge//Cali, Davide, “The enemy: A book about peace,” Children's Picture Book Database at Miami University, accessed April 19, 2019, https://dlp.lib.miamioh.edu/picturebook/items/show/11361.